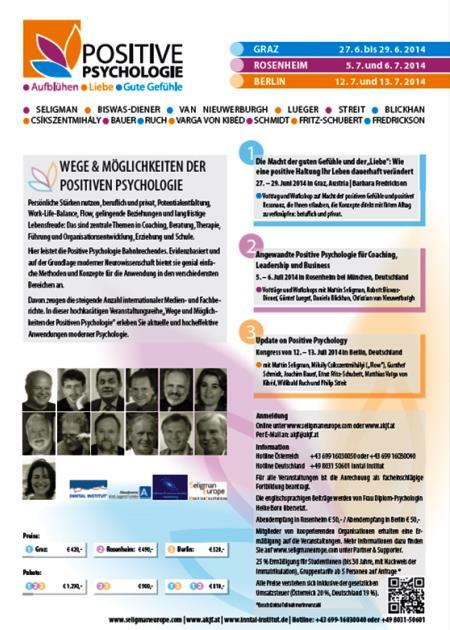 If you are interested in Positive Psychology and happen to live in (central) Europe, you might be interested to hear that Martin Seligman is coming to Germany in the summer of 2014 together with some other big names in the field, such as Mihály Csíkszentmihályi, and Barbara Fredrickson for several conferences. This is a great way to get updated on the latest developments in Positive Psychology. The presentation will be in English and translated into German. For more information, please refer to this (German) Flyer.